With today's Sony announcement of the RX100 compact camera with a 1" sensor and Canon's near m4/3-sized G1x the squeeze that I predicted over three years ago is well upon us. As a reminder, I pointed out that as smart phone cameras got better—and it was clear they were going to because of all the dedicated engineering from huge companies that was happening on the sensor and lens constraints of phone cameras—compact cameras would have to move upwards. Meanwhile, low-end DSLRs would have to get better to cope with the then emerging mirrorless cameras in the middle. Frankly, I didn't expect so much pricing overlap between mirrorless and DSLRs (nor between compacts and DSLRs, for that matter). Nikon especially is guilty of this: you can buy a D5100 for less than a V1, which is a pretty astonishing thing when you consider that a D5100 costs more to produce in almost every way (more expensive electronics, more complex build with additional hand assembly, more parts overall, more alignment constraints in manufacturing, etc.). Essentially Nikon is charging a "newer and smaller" tax. 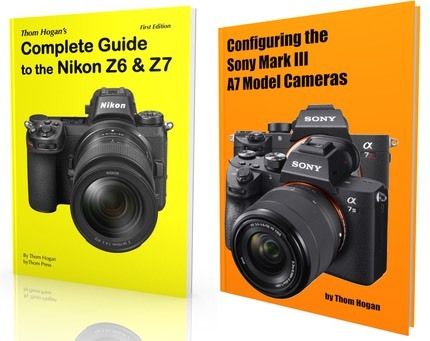 Meanwhile, at the compact end we now have Sony and Canon overlapping the two smaller main mirrorless sensor sizes (Nikon's CX and m4/3). And again with the price overlap: you can buy a mirrorless Panasonic G3 with kit lens for less than the Canon G1x compact. Plus many of the low-end m4/3 cameras are cheaper than the new Sony RX100. From a consumer standpoint, this is (sort of a) good thing. The "sort of" is in parentheses because there are clear overpriced and underpriced cameras at the moment, and trying to figure out which is which isn't necessarily easy. As much as I really like the Canon G1x (I took it with Canon's low cost underwater housing on my Grand Canyon rafting trip), it's priced like a mid-range DSLR but most certainly doesn't perform like one. Thus, Canon is saying you're paying for the convenience of a large sensor in a small compact camera capable body. I'd say you're paying too much. US$599 is a more reasonable price for it, considering the alternatives you can get. But the "good" part for consumers is that you have a wide range of choices, and this is only going to get more crowded in the near future. Canon (G1x), Fujifilm (X100), Leica (X2), Sigma (DP1/2), and Sony (RX100) will not be the only large sensor compact camera makers. Canon has yet to introduce their mirrorless entry. Olympus will be back with more 4/3 (not m4/3) DSLRs and Canikony (that's Canon, Nikon, Sony) will continue to push the low-end DSLRs. All these things mean you're going to find a lot of choice in the US$499 to US$999 range, and there's going to be a lot of overlap. The plethora of choice won't last, though. We have maybe two years before the dust settles and we see where the clear winners end up. There's no good news for anyone. The large sensor compact really steals the thunder from the E-PM1, GF5, and J1 type mirrorless cameras, I think. With full frame (FX) DSLRs slowly pushing down their price into the under US$2000 range, that squeezes the crop sensor DSLRs and we'll see more competent models of that type at the US$1000 mark. That leaves a narrow window for mirrorless with one potential out: add phase detect autofocus to the sensor and high-end mirrorless makes more sense to most people than low-end DSLR at the same price. The operative word here is collision (thus the title of the article). The level of camera we're talking about sells between 20-30 million units a year, depending upon exactly where you draw the high-end compact line. Now count the players that want to be there: Canon, Fujifilm, Leica, Nikon, Olympus, Panasonic, Pentax, Samsung, and Sony. You can't carve that pie nine ways and have everyone happy. Nikon and Olympus are under enormous pressure to get major shares in this range. Nikon because they're the only large "mostly camera company" left, so any damage to their sales threatens the entire company. Olympus because for them to continue in cameras they have to win in this game; the recent financial problems outside the imaging division have put the camera division under intense scrutiny to produce results. Canon, of course, expects to be number one, and Sony aspires to be number one. Samsung wants to do better than Sony in cameras (and Apple in computing devices) because their brand focus is basically "best mimic." Pentax needs to perform because they need to prove themselves to their new owner (Ricoh). So collision is the right word. As always, we'll end up with a couple of clear winners, a couple more hanging-on also-rans, and the remaining ones scrambling for a hold of any kind. But those competent compacts are a big threat. Imagine Nikon's V1 autofocus in an m4/3-sized sensor with Canon's G1x type controls and Samsung's WiFi. Heck, imagine what Apple would do with a large sensor compact camera. We're within sight of a truly competent pocket camera. That makes "your other camera" choice much more interesting, doesn't it? You can choose something like the Nikon 1 models, which doesn't get you very far from the competent pocket camera, if at all, all the way up to the makes-wall-size-murals FX DSLR. This collision is going to produce victims. The legacy mounts have the best chance of surviving, the newest ones are suspect, and m4/3 is right there in the middle.